Jeep 87-91 Wrangler; With factory soft top bows folded down. Black Denim. Dusters, Tonneaus - call them what you like, they provide protection and a clean smooth look. Available in a wide assortment of sizes and factory-match colors. 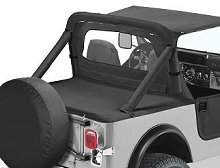 Models are available for Jeeps without soft tops, Jeeps with Supertops and Jeeps with factory tops. Quick to cover and quick to remove. Easy installation - attaches to a track mounting rail. Protects from mud, rain, etc. Looks great with a Bikini Top and a Windjammer.